The Mori family has owned this estate since the 18th century and have been growing grapes and selling wine to the local cooperative since the 1830s. However, it was not until the mid 1990s that Giacomo Mori renovated the vineyards and cellar and began estate bottling. Mori refurbished the family's spectacular cellar and re-equipped the ancient winery and cave. The cellar is dug into live tufo rock and is built on three different levels, in order to ensure that all the wine can be racked and transferred entirely by gravity feed. He chose only low-yielding rootstock and the finest clones of Chianti's indigenous Sangiovese and Canaiolo to resurrect his family's 10-hectare vineyard. He has spaced the vines tight, so as to force their roots to dig deep into the earth and yield maximum complexity. He prunes very short and employs only organic fertilization. No chemical sprays are used in the vineyards or the winery. Mori now produces two Chiantis of extraordinary quality: The Chianti Normale and the Chianti Castelrotto. The regular Chianti is a blend of 95% Sangiovese and 5% Canaiolo aged in the traditional large oak casks while the "Castelrotto" Riserva is 85% Sangiovese and 15% Merlot aged in French-oak barriques. Vinification takes place in stainless-steel tanks. 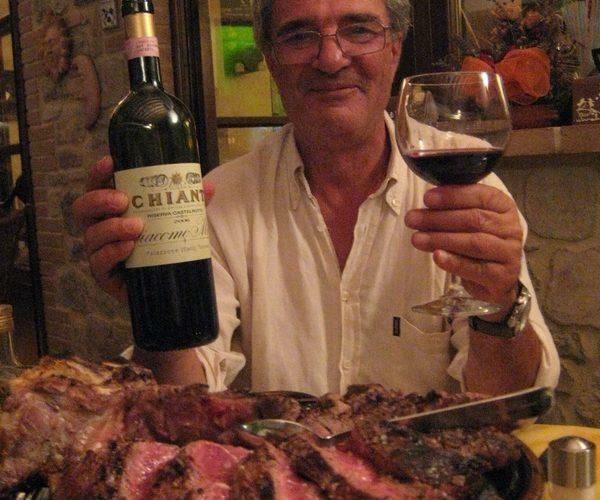 Both Chiantis are the very essence of Sangiovese, both elegant and concentrated at the same time. In the Veronelli Guide, Daniel Thomases awarded the 2003 Castelrotto 91 points, writing that "the true flavors of Chianti...the wines of Giacomo Mori have them, above all in the exquisite wine that bears his name."